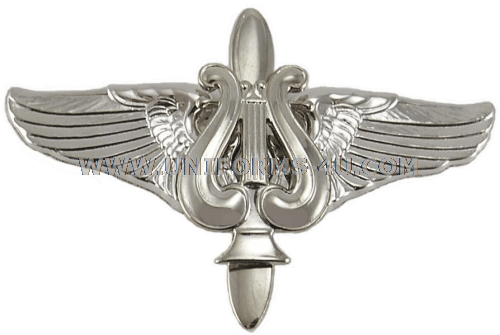 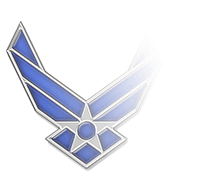 Just like members of the United States Honor Guard and similar ceremonial units or positions (Base Honor Guards, Color Guards, Arlington National Cemetery Chaplains, Military Funeral Details, and Drill Teams), members of the United States Air Force Band, the Air Force Academy Band, and USAF Regional Bands are authorized to wear their own distinct cap insignia: a chrome device featuring a winged lyre with an overlaid propeller. 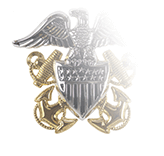 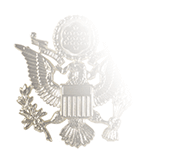 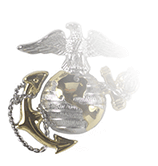 Manufactured in the U.S. with Mil-Spec materials to meet or exceed all Air Force regulations, the chrome lyre-and-propeller insignia perfectly complements the silver-trimmed bill and silver chinstrap of the Ceremonial Cap worn by band members with the Ceremonial uniform. 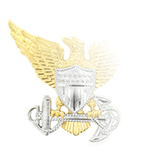 The distinctive winged lyre and propeller was prominently displayed on the crest of the United States Air Force Pipe Band, which was informally established in 1950, formally activated in 1960, and unfortunately inactivated in 1970.